I have been always fascinated by home automation devices and ever wanted to get one of these security home camera, home temperature monitor or even lights and air conditioner. Even more, I dreamed of remotely control things in my home from outside by using my phone. That takes me to create my own customized home automation project that integrates IoT technology, into only one device... an IoT home automation device! The device is placed near the home door and is always connected to the internet via my wifi router. And you can monitor your home environment and control things by using just an app on your smartphone, called IoT MQTT Panel. Once you are outside home you can monitor your home light and control it from the app by using a relay. Also, you can monitor gas level inside your home with the gas sensor and once it gets a dangerous level, an email will be sent to you automatically from the device so you can take a quick action upon it and also the alarm buzzer will be turned on and will stay alarming until someone notice it and press it down. And even take multiple pictures from different angles and they will be sent to your email. And when you are about to leave the office back to your home then you can cool things by checking the home temperature and turn on the AC with an auto-optimization mode. This is done by using an IR sensor directed to the AC and the auto-optimization mode will increase the AC temperature set point automatically each 2 minutes for 2 times so that once you get arrived your home is cooled nicely, not frozen! Once you arrive home and open the door, the ultrasonic sensor will detect your door movement and the device will tell you (with a text-to-speech) to enter your pre-saved fingerprint so that the device knows that you are an authorized person. What if he wasn't an authorized one? Then the device will wait for 30 seconds and if the fingerprint hasn't been entered and matched, then it will take a photo of that stranger and send it back to the owner's email. In addition, once you press the speak button on your app, the device will activate the voice-commands and listen to what you want like playing music or turning lights on/off. Here, you can get relaxed reading your favourite book and listening to your favorite music after a heavy working day! I am going to use Arduino with the IoT shield existed in 1Sheeld. 1Sheeld is basically an Arduino shield that collects 40+ shields into only one shield! IoT Shield for making the communication with the CloudMQTT online server. FingerPrint Scanner Shield to authorize the home entrance. Buzzer Shield to act like an alarm for the high gas level. Camera Shield to take photos of inside home. Email Shield to get emails of photos taken by the phone's camera and gas alet's emails. Music Player Shield for playing music from phone. Terminal Shield acts like a serial monitor "for debugging only." Voice Recognition Shield which is the way I order the device to do what I want orally. An iPhone to be connected with the 1Sheeld so that Arduino can connect to the internet (and to the IoT online server, indeed) through the IoT shield in the iPhone's 1Sheeld app. An Android phone to use it as my personal phone that has the IoT MQTT Panel App. And these of course in addition to the listed components and fabrication materials. So, I will go with you step by step to build this project from scratch but please be patient since there is quite steps, components and coding here. I recommend you go for this 1Sheeld getting started tutorial to get familiar with 1Sheeld. 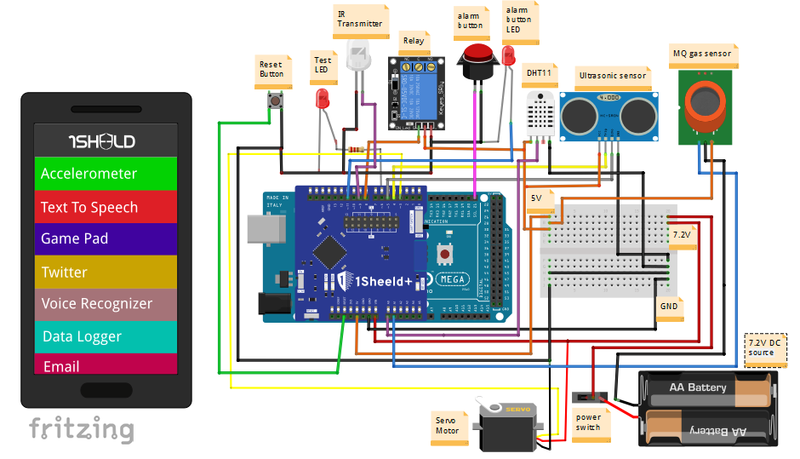 Also, check this simple IoT tutorial with Arduino+1Sheeld to get familiar with the IoT shield of 1Sheeld and how to setup the IoT MQTT Panel App and the cloud MQTT server. First, get the cardboard foam material and cut it into the below described dimensions so you get 6 faces of the box. Don't forget to make the holes for the components like ultrasonic, gas sensor, etc. Now comes the assembly part where you glue the 5 faces of the box using the glue gun. Note: the box door is fixed to its closing position by using 2 small magnets placed on the box door and 2 metal pieces placed on the correct faced closing place. You better start with plugging the 1Sheeld over the Arduino and install it inside the box. 1 - Connect the jumper wires to the components: DHT sensor, ultrasonic, servo, LEDs, buttons, etc. 2 - Glue each component to its hole over its place in the box using the glue gun. 3 - Connect the other jumper wires terminal to the Arduino or power. I have designed a sticker profile to cover the box so that it gets a visual polish. The sticker is divided into 6 faces, indeed where you can download them from here. Or you can use your own customized sticker. Then it's time to adjust the device near your home door with a helping 3D printed 4 parts (2 over the box itself and 2 over the wall). You will find the (.gcode) for it in the CAD part of the project so that your can print them directly with the 3S printer. Finally, connect the 2 relay output wires to the wall light switch. And tape the IR to be pointed to face your air conditioner. Turning your Air Conditioner on/off at a temperature of 23. Increasing your Air Conditioner temperature from 23 to 24. Increasing your Air Conditioner temperature from 24 to 25. The last 2 codes are required for the Auto-Optimization mode. For me, this was the most difficult part of the whole code since all IR remote libraries on the internet for Arduino aren't compatible with long range of the codes generated by the Air Conditioner IR remotes since these remotes generates IR codes with much more number of complex bits that popular Arduino IR remote libraries can't recognize. If you noticed, the IR code for on/off switch has negative numbers. Many of them, actually. Here, you must remove all these (-) signs and copy the whole code with all numbers are positive to your project code. Just replace the (irArray) content with the code you got which contains the negative (-) numbers and upload the code to the Arduino and you will get your new positive numbers IR code ready to be copied to the project code. And repeat that with the temp (+) button when Air Conditioner is turned on at 23 c and temp (+) button again when Air Conditioner is on at 24 c.
Copy these arrays to replace them with those in the project code. Note: You have to add these attached code files [dht.cpp - dht.h - TimerOne.cpp - TimerOne.h] in the same folder of the Arduino code file as they are libraries I used in the Arduino code. Finally, open the 1Sheeld app and connect it to the 1Sheeld board via Bluetooth. Now move on to download the IoT MQTT Panel App. You need to configure the app with MQTT server instance credentials you have gotten from the CloudMQTT online server. And this IoT Temperature sensor tutorial which will show you how to add a sensor reading widget and use it with the app. Release the IoT Home Automation Monster! And connect your iPhone with the 1Sheeld then press the reset button on the device left side. Then open the IoT MQTT Panel App and you are ready to go and control and monitor your home anytime, anywhere with just your own smartphone! If you have any comment or feedback please let me know in the comments below. irsend.sendRaw(temp24, sizeof(power) / sizeof(temp24), khz); //No the approach used to automatically calculate the size of the array. irsend.sendRaw(temp25, sizeof(power) / sizeof(temp25), khz); //Note the approach used to automatically calculate the size of the array. //Compare the last command received by the Arduino Voice Recognition Shield with the command "on"
//Compare the last command received by the Arduino Voice Recognition Shield with the command "off"
//Compare the last command received by the Arduino Voice Recognition Shield with the command "play music"
//Compare the last command received by the Arduino Voice Recognition Shield with the command "pause music"
irsend.sendRaw(power, sizeof(power) / sizeof(power), khz); //Note the approach used to automatically calculate the size of the array.